Combine Kitchen is in what some of us call Foncho, the area east of the 15 Freeway that is almost Fontana but is still Rancho Cucamonga. Specifically, it’s in a modern center near Sacred Heart Catholic that has (ooh-la-la) Tilted Kilt, Starbucks and the area’s first dim sum restaurant, China Republic. Combine is like almost nothing else in the area: a hipster coffeehouse with gastropub food, from a menu that changes seasonally. A foodie pal raved about it. 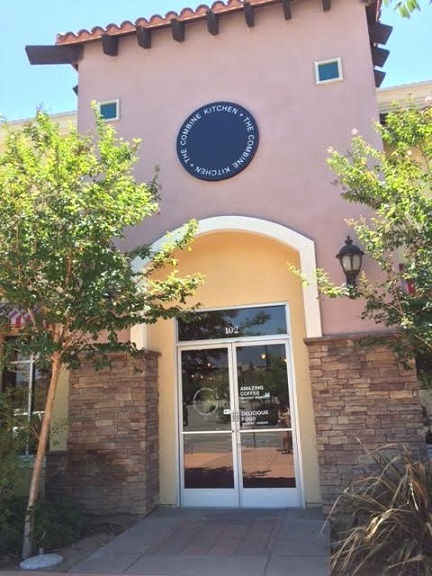 A friend and I took a long lunch there recently. 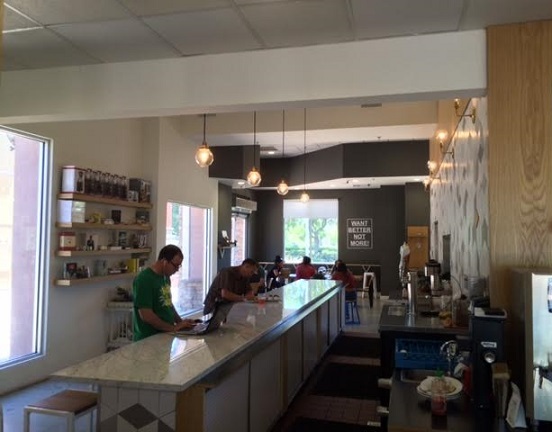 The menu has only a few items — five sandwiches, five breakfast items and three bowls, plus a special or two. Vegetarian and gluten-free items are marked, although there may not be enough of them; a vegetarian friend whom I invited for dinner declined because all she could get was one item, which had goat cheese, which she didn’t like. So there’s that. 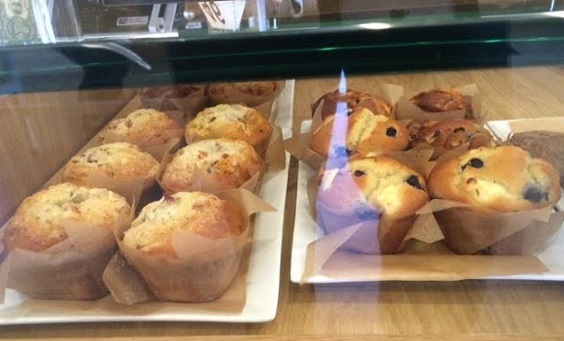 There are muffins and cookies at the counter, by the way. But back to lunch. 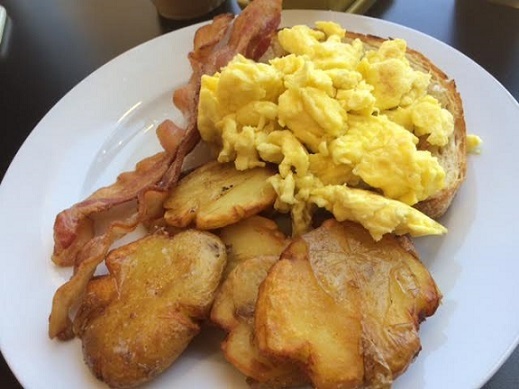 My friend had the Combine breakfast, scrambled eggs with bacon, potatoes and garlic toast ($11.50), plus an iced coffee ($4.45). 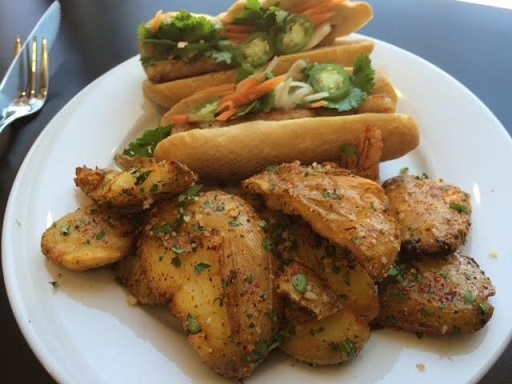 I got the pork belly banh mi sandwich ($11.50) and potatoes, plus a cold brew float ($6.50). For seating, there’s a counter, communal tables and a shallow window counter, plus some nooks and crannies, the whole room sleek and modern, with lots of natural light. At one table, a mother was teaching her young son to read. 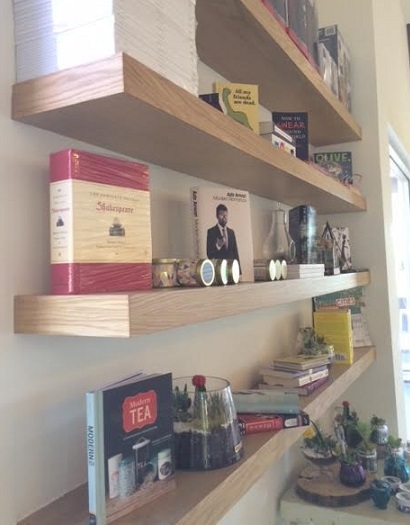 There are a few shelves with specialty items arranged for sale, including books. We liked our food, including the potatoes, which are smashed flat. 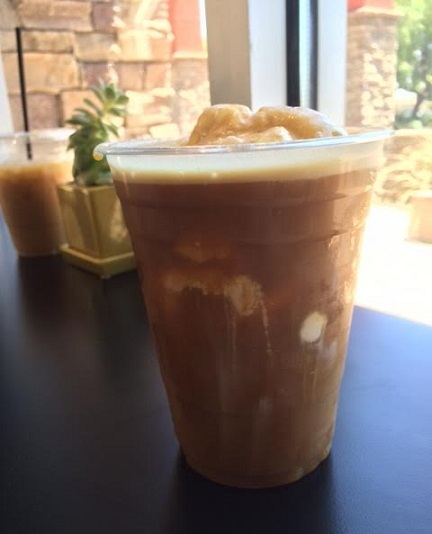 As a non-coffee person, I’m not sure what I was thinking by ordering a cold brew float. I had the jitters from the first sip that lasted the rest of the day. But that might be your thing. 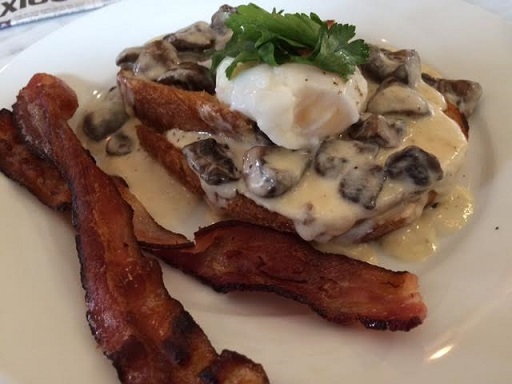 My foodie friend at last report had enjoyed the steak and eggs on garlic toast, shrooms and eggs on toast, lox and pork belly, all of which he called amazing, as well as several coffee drinks. 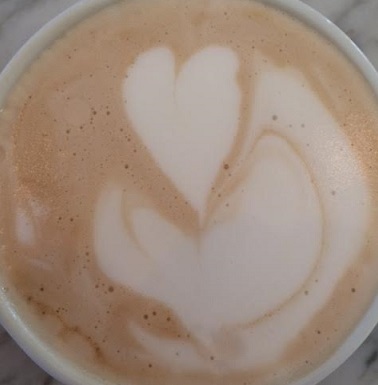 Combine is open for coffee from 7 a.m. to 10 p.m. daily. For food, breakfast and lunch are served from 8 a.m. to 3 p.m.; after a two-hour break, the dinner menu runs from 5 to 9 p.m., except Mondays. Basically, it’s a bit of Silver Lake in Rancho Cucamonga. If that sounds as appealing to you as it does to me, further instructions are unnecessary. Update September 2016: I had breakfast: shrooms on toast, with a side of bacon, and it was even better than I’d hoped, plus a chai latte. 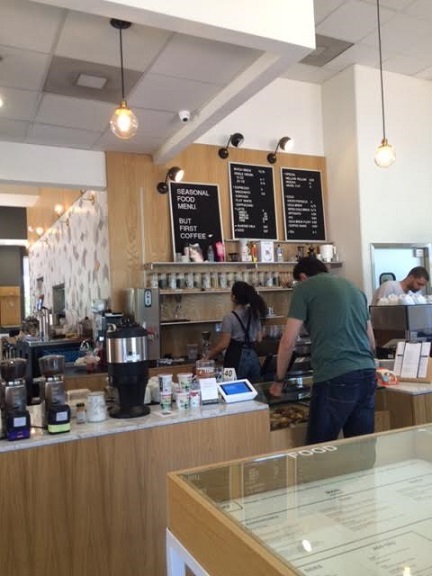 This entry was posted in Restaurants: Rancho Cucamonga and tagged coffee, hipster, Rancho Cucamonga, restaurants by David Allen. Bookmark the permalink.